During case import from excel, the status column says “info no longer available” as shown in the image below. This does sound like a bug. Could you report an issue? That way our support team will be able to look at your project in particular to uncover what the issue is. @Martin_Mutuku I was able to successfully import starting the next day after I flagged this issue. Please try tomorrow or after some hours; but, I haven’t tried it today. I really appreciate your effort to see that the problem is sorted. 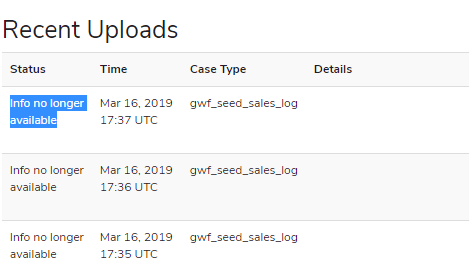 As you can see the problem is still there in the server, we created and uploaded cases last year, but this year we wanted to update the cases by downloading the old cases and merging with data from external sources and then uploading the cases with the same format as we downloaded. After mapping the properties we get an error instead if progress yet we did the same thing last year. How do we report a bug to the dev team? Or can they look into our project space and help us know what the problem is? Acknowledging that this is a bug, and our team is working on a fix. I will send you a confirmation once we deploy a fix. Appreciate your patience. Thank you.